Slavic languages do. Like Polish, it has both hard postalveolars (/ʂ ʐ/) and soft ones (/t͡ɕ ɕː ʑː/). Russian has vowel reduction in unstressed syllables. This feature is found in English, but not in most[clarification needed] other Slavic languages, such as Polish and Czech. Moscow school, rests on the complementary distribution of [ɨ] and [i], with the former occurring after hard (non-palatalized) consonants and [i] elsewhere. Native Russian speakers' ability to articulate [ɨ] in isolation: for example, in the names of the letters ⟨и⟩ and ⟨ы⟩. Rare instances of word-initial [ɨ], including the minimal pair икать 'to produce the sound и' and ыкать 'to produce the sound ы'), as well as borrowed names and toponyms, like Ыб [ɨp] (help·info), the name of a river and several villages in the Komi Republic. Morphological alternations like готов [ɡɐˈtof] ('ready' predicate, m.) and готовить [ɡɐˈtovʲɪtʲ] ('to get ready' trans.) between palatalized and non-palatalized consonants. * Reduced ⟨ё⟩ is written as ⟨е⟩. † ⟨е⟩ is used in most loans (except if word-initial) or after ц, ш, ж. /o/ has merged with /a/: for instance, валы́ 'bulwarks' and волы́ 'oxen' are both pronounced /vaˈlɨ/, phonetically [vɐˈɫɨ]. /e/ has merged with /i/ (or /i/ and /ɨ/ if /ɨ/ is considered a phoneme): for instance, лиса́ (lisá) 'fox' and леса́ 'forests' are both pronounced /lʲiˈsa/, phonetically [lʲɪˈsa]. [example needed] /a o[clarification needed]/ have merged with /i/ after soft consonants: for instance, ме́сяц (mésjats) 'month' is pronounced /ˈmʲesʲit͡s/, phonetically [ˈmʲesʲɪt͡s]. In the syllable immediately before the stress, when a hard consonant precedes: паро́м [pɐˈrom] (help·info) ('ferry'), трава́ [trɐˈva] ('grass'). In absolute word-initial position. In hiatus, when the vowel occurs twice without a consonant between; this is written ⟨aa⟩, ⟨ao⟩, ⟨oa⟩, or ⟨oo⟩: сообража́ть [sɐ.ɐbrɐˈʐatʲ] ('to use common sense, to reason'). [ə] appears elsewhere, when a hard consonant precedes: о́блако [ˈobɫəkə] ('cloud'). When a soft consonant or /j/ precedes, both /o/ and /a/ merge with /i/ and are pronounced as [ɪ]. Example: язы́к [jɪˈzɨk] 'tongue'). /o/ is written as ⟨e⟩ in these positions. жал- 'regret': e.g. жале́ть [ʐɨˈlʲetʲ] ('to regret'), к сожалéнию [ksəʐɨˈlʲenʲɪju] ('unfortunately'). ло́шадь 'horse', e.g. лошаде́й, [ɫəʂɨˈdʲej] (pl. gen. and acc.). -дцать- in numbers: e.g. двадцати́ [dvət͡sɨˈtʲi] ('twenty [gen., dat., prep. ]'), тридцатью́ [trʲɪt͡sɨˈtʲju] ('thirty [instr.]'). ржано́й [rʐɨˈnoj] ('rye [adj. m. nom.]'). жасми́н [ʐɨˈsmʲin] ('jasmine'). These processes occur even across word boundaries as in под морем [pɐd‿ˈmorʲɪm] ('under the sea'). Vowels may not merge in foreign borrowings, particularly with unusual or recently borrowed words such as ра́дио, [ˈradʲɪ.o] (help·info) 'radio'. In such words, unstressed /a/ may be pronounced as [ɐ], regardless of context; unstressed /e/ does not merge with /i/ in initial position or after vowels, so word pairs like эмигра́нт and иммигра́нт, or эмити́ровать and имити́ровать, differ in pronunciation. Across certain word-final inflections, the reductions do not completely apply. For example, after soft or unpaired consonants, unstressed /a/, /e/ and /i/ of a final syllable may be distinguished from each other. For example, жи́тели [ˈʐɨtʲɪlʲɪ] ('residents') contrasts with both (о) жи́теле [(o) ˈʐɨtʲɪlʲɛ] ('[about] a resident') and жи́теля [ˈʐɨtʲɪlʲə] ('of a resident'). If the first vowel of ⟨oa⟩, or ⟨oo⟩ belongs to the conjunctions но ('but') or то ('then'), it is not reduced, even when unstressed. 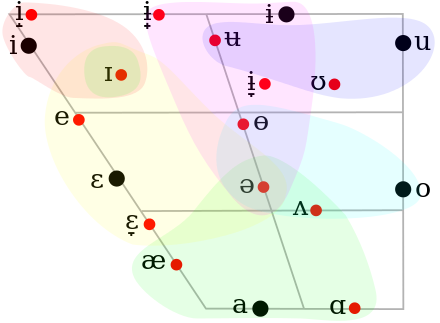 Moscow phonology school uses an analysis with morphophonemes (морфоне́мы, singular морфоне́ма). It treats a given unstressed allophone as belonging to a particular morphophoneme depending on morphological alternations, or on etymology (which is often reflected in the spelling). For example, [ɐ] is analyzed as either a or o. To make a determination, one must seek out instances where an unstressed morpheme containing [ɐ] in one word is stressed in another word. Thus, because the word валы́ [vɐˈɫɨ] ('shafts') shows an alternation with вал [vaɫ] ('shaft'), this instance of [ɐ] belongs to the morphophoneme a. Meanwhile, волы́ [vɐˈɫɨ] ('oxen') alternates with вол [voɫ] ('ox'), showing that this instance of [ɐ] belongs to the morphophoneme o. If there are no alternations between stressed and unstressed syllables for a particular morpheme, then the assignment is based on etymology. Some linguists prefer to avoid making the decision. Their terminology includes strong vowel phonemes (the five) for stressed vowels plus several weak phonemes for unstressed vowels: thus, [ɐ] represents the weak phoneme /ɐ/, which contrasts with other weak phonemes, but not with strong ones. Diphthongs Russian diphthongs all end in a non-syllabic [i̯], an allophone of /j/ and the only semivowel in Russian. In all contexts other than after a vowel, /j/ is considered an approximant consonant. Phonological descriptions of /j/ may also classify it as a consonant even in the coda. In such descriptions, Russian has no diphthongs. The first part of diphthongs are subject to the same allophony as their constituent vowels. Examples of words with diphthongs: яйцо́ [jɪjˈt͡so] (help·info) ('egg'), ей [jej] ('her' dat. ), де́йственный [ˈdʲejstvʲɪnnɨj] ('effective'). /ij/, written ⟨-ий⟩ or ⟨-ый⟩, is a common inflexional affix of adjectives, participles, and nouns, where it is often unstressed; at normal conversational speed, such unstressed endings may be monophthongized to [ɪ̟]. Consonants ⟨ʲ⟩ denotes palatalization, meaning the center of the tongue is raised during and after the articulation of the consonant. Phonemes that have at different times been disputed are enclosed in parentheses. Most consonant phonemes come in hard–soft pairs, except for always-hard /t͡s, ʂ, ʐ/ and always-soft /t͡ɕ, ɕː, j/ and formerly /ʑː/. There is a marked tendency of Russian hard consonants to be velarized, though this is a subject of some academic dispute. Velarization is clearest before the front vowels /e/ and /i/. Moscow accent, and is somewhat obsolete. The corresponding modern pronunciation is hard [ʐː]. This sound may derive from an underlying /zʐ/ or /sʐ/: заезжа́ть [zə(ɪ̯)ɪˈʑːætʲ], modern [zə(ɪ̯)ɪˈʐːatʲ]. In modern accent it can only be formed by assimilative voicing of [ɕː] (including across words): вещдо́к [vʲɪʑːˈdok]. For more information, see alveolo-palatal consonant and retroflex consonant. /ʂ/ and /ʐ/ are somewhat concave apical postalveolar. They may be described as retroflex, e.g. by Hamann (2004), but this is to indicate that they are not laminal nor palatalized; not to say that they are subapical. Hard /t, d, n/ are laminal denti-alveolar [t̪, d̪, n̪]; unlike in many other languages, /n/ does not become velar [ŋ] before velar consonants. Hard /ɫ/ has been variously described as pharyngealized apical alveolar [l̺ˤ] and velarized laminal denti-alveolar [l̪ˠ]. Hard /r/ is postalveolar, typically a trill [r̠]. Soft /rʲ/ is an apical dental tap [ɾ̪ʲ] or, less often, an apical dental trill [r̪ʲ]. Soft /tʲ, dʲ, nʲ/ are laminal alveolar [t̻ʲsʲ, d̻ʲzʲ, n̻ʲ]; as indicated in the transcription, in case of the first two the tongue is raised enough to produce slight frication. Soft /lʲ/ is either laminal alveolar [l̻ʲ] or laminal denti-alveolar [l̪ʲ]. /t͡s, s, sʲ, z, zʲ/ are dental [t̪͡s̪, s̪, s̪ʲ, z̪, z̪ʲ], i.e. dentalized laminal alveolar. They are pronounced with the blade of the tongue very close to the upper front teeth, with the tip of the tongue resting behind lower front teeth. A marginal phoneme /ɣ/ occurs instead of /ɡ/ in certain interjections: ага́, ого́, угу́, эге, о-го-го́, э-ге-ге, гоп. (Thus, there exists a minimal pair of homographs: ага́ [ɐˈɣa] (help·info) 'aha!' vs ага́ [ɐˈɡa] 'agha'). The same sound [ɣ] can be found in бухга́лтер (spelled ⟨хг⟩, though in цейхга́уз, ⟨хг⟩ is [x]), optionally in га́битус and in a few other loanwords. Also optionally (and less frequently than a century ago) [ɣ] can be used instead of [ɡ] in certain religious words (a phenomenon influenced by Church Slavonic pronunciation): Бо́га, Бо́гу... (declension forms of Бог 'God'), Госпо́дь 'Lord' (especially in the exclamation Го́споди! 'Oh Lord! '), благо́й 'good'. Some linguists (like I. G. Dobrodomov and his school) postulate the existence of a phonemic glottal stop /ʔ/. This marginal phoneme can be found, for example, in the word не́-а [ˈnʲeʔə] (help·info). Claimed minimal pairs for this phoneme include су́женный [ˈsʔuʐɨnɨj] 'narrowed' (a participle from су́зить 'to narrow', with prefix с- and root -уз-, cf. у́зкий 'narrow') vs су́женый [ˈsuʐɨnɨj] 'betrothed' (originally a participle from суди́ть 'to judge', now an adjective; the root is суд 'court') and с А́ней [ˈsʔanʲɪj] 'with Ann' vs Са́ней [ˈsanʲɪj] '(by) Alex'. Soft: гёзы, гюрза́, гяу́р, секью́рити, кекс, кяри́з, са́нкхья, хянга́; Hard: кок-сагы́з, гэ́льский, акы́н, кэб (кеб), хэ́ппенинг. Soft: Алигье́ри, Гёте, Гю́нтер, Гянджа́, Джокьяка́рта, Кёнигсберг, Кюраса́о, Кя́хта, Хью́стон, Хёндэ, Хю́бнер, Пюхяя́рви; Hard: Мангышла́к, Гэ́ри, Кызылку́м, Кэмп-Дэ́вид, Архы́з, Хуанхэ́. Soft: forms of the verb ткать 'weave' (ткёшь, ткёт etc., and derivatives like соткёшься); догёнок/догята, герцогёнок/герцогята; and adverbial participles of the type берегя, стерегя, стригя, жгя, пекя, секя, ткя (it is disputed whether these are part of the standard language or just informal colloquialisms); Hard: the name гэ of letter ⟨г⟩, acronyms and derived words (кагебешник, днепрогэсовский), a few interjections (гы, кыш, хэй), some onomatopoeic words (гыгыкать), and colloquial forms of certain patronyms: Олегыч, Маркыч, Аристархыч (where -ыч is a contraction of standard language's patronymical suffix -ович rather than a continuation of ancient -ич). Moscow pronunciation, softening was more widespread and regular; nowadays some cases that were once normative have become low colloquial or archaic. In fact, consonants can be softened to very different extent, become semi-hard or semi-soft. The more similar the consonants are, the more they tend to soften each other. Also, some consonants tend to be softened less, such as labials and /r/. Softening is stronger inside the word root and between root and suffix; it is weaker between prefix and root and weak or absent between a preposition and the word following. Before soft dental consonants, /lʲ/ and often soft labial consonants, dental consonants (other than /t͡s/) are soft. /x/ is assimilated to the palatalization of the following velar consonant: лёгких [ˈlʲɵxʲkʲɪx] (help·info)) ('lungs' gen. pl.). Palatalization assimilation of labial consonants before labial consonants is in free variation with nonassimilation, that is бомбить ('to bomb') is either [bɐmˈbʲitʲ] or [bɐmʲˈbʲitʲ] depending on the individual speaker. When hard /n/ precedes its soft equivalent, it is also soft and likely to form a single long sound (see gemination). This is slightly less common across affix boundaries. For speakers who pronounce [ɕt͡ɕ] instead of [ɕː], words like общий ('common') also constitute clusters of this type. Russian language § The yo vowel. ^ Avanesov 1975, p. 105-106. ^ Yanushevskaya & Bunčić (2015:225) ^ Padgett & Tabain 2005, p. 16. ^ a b Jones & Ward 1969, p. 51. ^ Jones & Ward 1969, p. 194. ^ Jones & Ward 1969, p. 38. ^ Avanesov 1985, p. 663. ^ Zarva 1993, p. 13. ^ Avanesov 1985, p. 663-666. ^ Zarva 1993, p. 12-17. ^ Halle 1959. ^ Avanesov 1975, p. 121-125. ^ Avanesov 1985, p. 666. ^ Zarva 1983, p. 16. ^ Wade, Terence Leslie Brian (2010). A Comprehensive Russian Grammar (3rd ed.). John Wiley & Sons. p. 10. ISBN 978-1-4051-3639-6. ^ Avanesov 1975, p. 37-40. ^ e.g. Avanesov (1975) ^ Jones & Ward 1969, p. 37. ^ Padgett 2001, p. 7. ^ a b Ashby (2011:133): "Note that though Russian has traditionally been described as having all consonants either palatalized or velarized, recent data suggests that the velarized gesture is only used with laterals giving a phonemic contrast between /lʲ/ and /ɫ/ (...)." ^ Padgett 2003b, p. 319. ^ Because of the acoustic properties of [u] and [i] that make velarization more noticeable before front vowels and palatalization before back vowels Padgett (2003b) argues that the contrast before /i/ is between velarized and plain consonants rather than plain and palatalized. ^ See dicionaries of Ageenko & Zarva (1993) and Borunova, Vorontsova & Yes'kova (1983). ^ The dictionary Агеенко & Зарва (1993) explicitly says that the nonpalatalized pronunciation /t͡s/ is an error in such cases. ^ Yanushevskaya & Bunčić (2015:223) ^ See Avanesov's pronunciation guide in Borunova, Vorontsova & Yes'kova (1983:669) ^ Padgett 2003a, p. 42. ^ Yanushevskaya & Bunčić (2015:224) ^ Hamann 2004, p. 64. ^ Hamann 2004, p. 56, "Summing up the articulatory criteria for retroflex fricatives, they are all articulated behind the alveolar ridge, show a sub-lingual cavity, are articulated with the tongue tip (though this is not always discernible in the x-ray tracings), and with a retracted and flat tongue body." ^ Jones & Ward (1969:99 and 160) ^ a b Koneczna & Zawadowski (1956:? ), cited in Ladefoged & Maddieson (1996:187) ^ Jones & Ward (1969:167) ^ Mathiassen (1996:23) ^ a b Skalozub (1963:? ); cited in Ladefoged & Maddieson (1996:221) ^ Jones & Ward (1969:104–105 and 162) ^ Jones & Ward (1969:172). This source mentions only the laminal alveolar realization. ^ Zygis (2003:181) ^ Dobrodomov & Izmest'eva 2002. ^ Dobrodomov & Izmest'eva 2009. ^ Padgett 2003a, pp. 44, 47. ^ Stankiewicz 1962, p. 131. ^ see Lightner (1972) and Bidwell (1962) for two examples. ^ See Stankiewicz (1962) and Folejewski (1962) for a criticism of Bidwell's approach specifically and the reductionist approach generally. ^ a b Halle 1959, p. 22. ^ Jones & Ward 1969, p. 156. ^ Lightner 1972, p. 377. ^ Lightner 1972, p. 73. ^ Halle 1959, p. 31. ^ Lightner 1972, p. 75. ^ Chew (2003:67 and 103) ^ Lightner 1972, p. 82. ^ Jones & Ward 1969, p. 190. ^ Padgett 2003a, p. 43. ^ Lightner 1972, pp. 9–11, 12–13. ^ Padgett 2003a, p. 39. ^ Аванесов, Р. И. (1984). Русское литературное произношение. М.: Просвещение. pp. 145–167. ^ Davidson & Roon 2008, p. 138. ^ Rubach 2000, p. 53. ^ Halle 1959, p. 57. ^ Ostapenko 2005, p. 143. ^ Proctor 2006, p. 2, 126. ^ Cubberley 2002, p. 80. ^ Shapiro 1993, p. 11. ^ Rubach 2000, p. 51. ^ Bickel & Nichols 2007, p. 190. ^ Toporov 1971, p. 155. ^ Zsiga 2003, p. 403. ^ a b c d e Cubberley 2002, p. 82. ^ Halle 1959, p. 69. ^ Lightner 1972, p. 130. ^ Lightner 1972, p. 4. ^ Jones & Ward 1969, pp. 79-80. ^ Jones & Ward 1969, p. 79. ^ Jones & Ward 1969, p. ?.